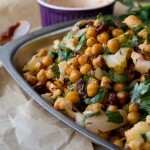 Deliciously spicy salad with juicy sweet raisins, roasted cauliflower and chickpeas. Preheat your oven to 400F and set out a large baking sheet. Add lemon juice, raisins and harissa to a small bowl. Set aside. 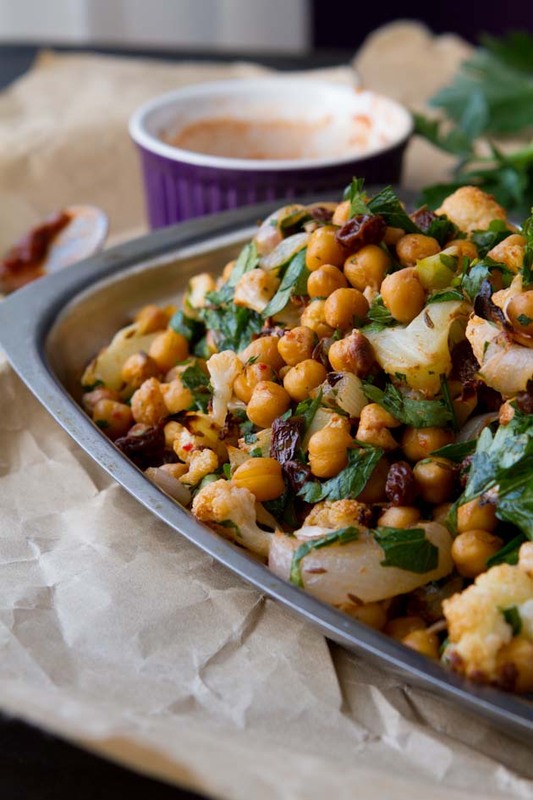 Add cauliflower florets, cooked chickpeas, onion, oil and cumin seeds to the large baking sheet and stir with your hands to coat all pieces in oil. Slide the baking sheet in the oven and roast veggies for 30 minutes, rotating once, or until cauliflower tops are lightly blackened. Remove from the oven and allow to cool. Add everything to a large bowl: roasted veggies, parsley, cilantro and soaked raisins with juices. Stir to coat, add salt to taste and serve! Harissa can be purchased in the ethnic isle of any grocery store. I used a white valencia onion. Extra virgin olive oil or coconut oil would work well in this recipe.